Bananas are an excellent source of nutrition and as such, are another perfect fruit to be one of baby’s first foods. Bananas are often called one of nature’s perfect foods because they are said to contain many of the nutrients that a person needs to survive. One of the most important nutritional components of Bananas is that they contain potassium and fiber. Bananas are also high in Vitamin B6, Vitamin C and Vitamin B2. The Potassium in bananas often gets a bad rap due to the confusion with sodium (salt). Potassium contributes to healthy blood pressure as well as healthy heart functions. Some studies have suggested that people who consume bananas and other foods high in potassium are less likely to develop atherosclerosis and high blood pressure. Bananas are also known as one of nature’s own antacids. They are known to help protect against stomach ulcers and ulcer damage. The reason for this seldom known and almost odd fact is that bananas contain “mucilaginous bulking substances”. The help the intestines with producing a mucousy lining and are very very easy to digest. Please be aware that bananas are also know to cause constipation when eaten in large quantities. When can I introduce Bananas to my baby? Bananas may be introduced to your baby as early as 4 months old. Please remember that the recommended age to begin introducing solid foods is between 4-6 months old, with 6 months being the idea age. Bananas have been associated with Latex allergies and sensitivities so ask your pediatrician about introducing bananas to your baby if there is a history of Latex issues. As always we recommend you consult with your pediatrician about introducing solid foods to your baby. Besides all of the above fantastic healthy qualities, bananas are the one of the best convenience foods. They come in their own jackets and there is no need to wash them; simply peel & eat. This gives the banana a big thumbs-up for parents; when it comes time for and travel, take out a banana and feel great knowing that you and your children are indulging in one of nature’s perfect foods. Many think that bananas are highly contaminated with pesticides however this is not true. According to the EWG, bananas are not one of the “dirty dozen” foods that are most highly contaminated with pesticides – purchasing organic is a personal choice. 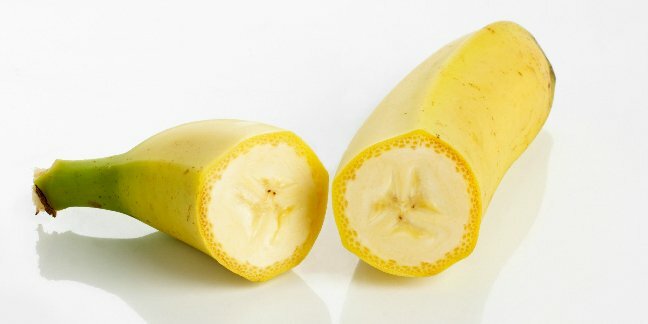 There should be no need to use a machine as bananas, just like avocados, will have a very soft consistency and texture. Avocados and Bananas do not need to be cooked. Step 4: Place in a blender or food processor and puree until desired texture is achieved. Step 1: Place all ingredients in a blender or food processor and blend until smooth but not runny and thin – or simply hand whip the ingredients together if you prefer. Step 2: Pour mixture into custard/ramekins and bake at 350F for approximately 20 minutes. Step 3: Check every 10 minutes as the time can vary depending on how thick/thin you made the mixture. This will begin to split like a pumpkin or custard pie does when finished. Step 4: Test with a clean knife inserted into the center; it’s done when the knife comes out clean. This can also be made by scrambling in a frying pan on low heat, with a bit of olive oil. Step 1: Bring water to a boil in a saucepan. Step 2: Gradually add tapioca, stirring constantly. Step 3: Reduce heat to low & cook 5 minutes, continuing to stir constantly. Step 4: Separately puree the banana & add to the mixture. Step 5: Blend tapioca with yogurt & banana. Step 1: In a small frying pan, gently heat 2 tbs of butter. Step 2: Slice the bananas into thin slices or dices. Step 3: Add bananas to the pan and sauté. Step 4: Sprinkle with spices if desired and mash if needed. Step 1: Combine ingredients and warm gently in a sauce pan. Stir frequently. Step 2: Remove warmed pudding to a food processor or blender and blend as needed for a texture your baby will enjoy. Do not blend if serving to an older baby who can handle texture. Save some for yourself too. Yum.